Data from the Argo profiling floats - Source: Geophysical Research Letters, 2009.
in the arctic, the sea ice is retreating and the concentration of CO2 continues its way up. The next 3 pages contain links about the "Runaway" situation in front of us, if the forces of nature takes over. suddenly show up if e.g. "Superwaves" from the galactic center hits the earth. 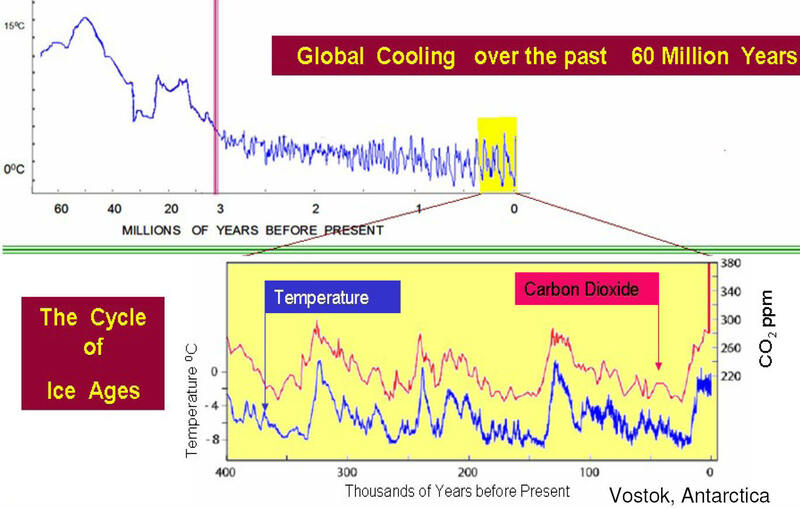 The Climate used to change within limits if we are looking 3 million years back. Those limits may now be broken - hopeful not like 55 million, 251 million and 635 million years ago. Present CO2 and methane levels are running off scale compared to the deepest layers of Ice from drillings. CO2 emitted to the atmosphere will stay there for centuries but 20-60% remain airborne for several thousand years. Even a 100% CO2 cut tomorrow will not remove the danger of Global Warming. Dimming the Sun is masking the problem - Global Dimming makes warming much worse. is between 1365 and 1367.
be offset by cleaner air in other regions. but we did not get an "Ice Winter" Even 0 in sunspot number is not important. Zero over several decades may contribute more. Humans are now in charge of Climate Change, for better or worse. The facts are not communicated in clear speech. "The World Is a Bit of a Time Bomb". But worse - we are already running out of time. The new "methane problem" is not understood. We also have an oxygen crisis ! transform more O2 to CO2. The Earth's 6th Great Mass Extinction is Occurring as You Read This. should be handled in a rationale way like this. Random change in the weather is different from a sustained change of the climate. (El Nino/Southern Oscillation) alternating the surface temperature. must be used wisely as we are now running on "borrowed time". like a pacemaker, by changes in the earths orbit around the sun. out of the normal range, but after a delay as it takes time to heat up the oceans. It is like turning on an electric stove for heating water. That heating is now verified by instruments placed in the oceans - at least in the upper part of the oceans. We need measurements from every corner of the oceans to get the facts without ambiguity. of what is going on, to stop destructive arguing and to work together for solving the problems. 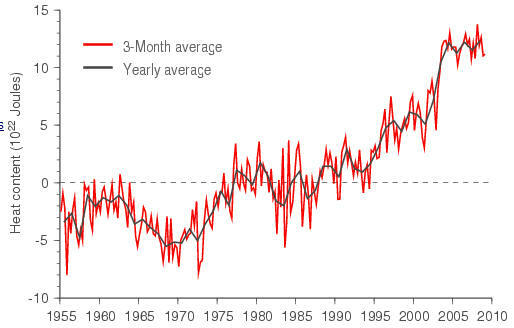 Some instrumental problems has been solved - Global ocean heat content 1955–2008. Ocean warming amplifies the melting of artic sea-ice what heats up the oceans even more, what melts more ice - an amplifying feed back loop. Unstoppable and irreversible Climate Change is now a very serious security risk beside the nuclear. The economy involved is also taking the front seat. More than 350ppm CO2 in the atmosphere is Killing Our Oceans. To set very low and easy to reach CO2 targets is a beginning - every small bit count - but the scale of the problem has to be understood as well as the present Level of Carbon Dioxide, else the risk is very high like driving fast in the fog. Something not seen in time may turn up and hit extremely hard. Why are we "driving in the fog ?" - Why do only very few care about the lifetime of CO2 in the air ? Go behind the numbers as e.g. explained by the Carbon Cycle on the next page. Why is the public not informed about what has the longest lifetime, nuclear radioactive waste or CO2 in the air ? Too scared to speak out ? The news media are not sufficiently addressing the severity of climate change. Computer models for abrupt climate change is very difficult to build. Climate Change gathers pace faster than many scientists expected but very few explain in plain language that it means that the human population is walking into a minefield. Robert F. Kennedy Jr. explain a little about why - it is strange as there is plenty of clean energy nearly for free. More education is needed on Tipping Points and feedbacks. The "forces of nature" are demonstrated in Records of abrupt climate events in the recent history, but we have to go millions of years back to find a similar threat as the one ahead of us. to reach it in time before the present "overheating" does too much damage to the CO2 sinks. The ocean can no longer buffer the effects of CO2. The present food chain in the oceans can not survive more than 350ppm CO2 in the atmosphere. More warming is in the pipeline from the extra CO2 stored in the atmosphere during the last 50 years. Feedback loops do amplify that heating. Rapid climate change is now a threat, it can be Abrupt Climate Change. That change will be huge if methane is released from the sea bottom. 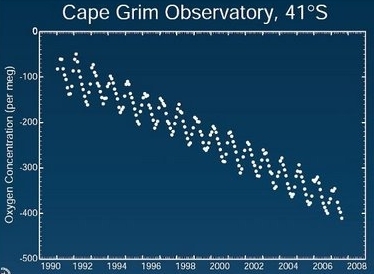 The red vertical part of the Carbon Dioxide curve below from last century will rise further in this century. It can be devastating as it will pull up the blue temperature curve. 30 000 years and the horrible spike in the red curve. the first 200 years, but the rest takes thousands of years unless new solutions turn up in time. Smaller "CO2 spikes" are normally reduced by natural weathering, but humans are releasing far too much. CO2 alone is a problem, but we have to add all the other amplifying elements to describe the real threat. Clathrates or methane hydrate may not be well known yet, but it will be. Take a look on fig.1. to see when it becomes unstable. The fast change in ecosystems may also not be well known, but it will be when the bill has to be paid. No plant CO2 relief in warm world. No relief from acidifying oceans. we are sending new orders each year that will add up to a devastating amount in sea level rise when delivered. Where do we stop on the scale of damage ? If the temperature keep on going up and enter a "run away mode", it will speed up and not stop when we reach year 2100. The unstoppable temperature will climb beyond +6°C pulled by the amplifying feedback elements listed on the next page. CNN founder Ted Turner underline the gravity. Methane starts to leak - it is a warning. Huge areas with permafrost is already melting but so far slowly. A little higher temperature and we can say Bye-Bye, West Antarctic Ice Sheet. Imagining the real life on a Greenhouse Earth - to allow the temperature to rise further is to play Russian roulette. The heat is switched on after a 3 million year chilly period - we are heading for "hot house", a more common state in earths history. A state without ice on Antarctica but tropical temperatures at the North Pole. Or - will humans balance the climate. Advice: mp3-audio - Graphs - Tipping Points near. The younger generation aims for 350 ppm, but they need help. VIDEO: Tipping point ahead. Advice: Plan B. Plan C.
Summery by: The Potsdam Institute for Climate Impact Research. Methane Catastrophes in Earth's Past . . . and Near Future ? - the details. Tipping elements in the Earth's Climate System. Overpopulation. Temperature - large logarithmic scale. - No emergency EXIT. History tells us a little about what to expect. Ice cores show that changes could come fast. There is no room for both a higher CO2 level and a higher temperature as they amplify each other. This time we get no help from "earth orbit change cooling" as in earlier warm periods between ice-ages. NASA predicts the near future, but the next page tells the real danger, if we do not stop now. 55 million, 251 million and 635 million years ago. Understand the risk. If most people do understand the danger, it will get first priority among politicians. We need knowledge, first priority and action - do not let too late be the final word. Humans are now controlling Climate Change like the crew in the cockpit of an aeroplane. If there is serious problems, the captain do not leave the cockpit saying - it is too late. He and the rest of the crew does the uttermost during an emergency landing. We can solve it - but time is up. Not facing up to climate change crisis is a crime. A boarder overview requires an understanding of the driving forces on page 2. TEACH-IN WEB CAST - Old thick ice becomes thinner. Climate change and trace gases. Emergency Network. Sun-activity. Reuters. STERN REVIEW - Feedback Dynamics - US National Academy of Sciences - Photo-evidence - IPCC summary - FAQ. - Blogs - BBC. 2008: 1 hour video lecture tells why CO2 is so important including comments on 4th generation nuclear low waste power plants. Lecture by Dr Rajendra Pachauri, Chairman of the Intergovernmental Panel of Climate Change.